Muhammad Ali, the heavyweight boxing champion named Sportsman of the Century by Sports Illustrated magazine, died June 3, 2016. He was 74. Born Cassius Clay Jan. 17, 1942, he began boxing as a preteen, enjoying an award-winning amateur career. He won six Golden Gloves titles in his home state of Kentucky, two national Golden Gloves titles and an Amateur Athletic Union National Title. His amateur career culminated with a gold medal at the 1960 Summer Olympics in Rome, Italy. Clay moved to a professional boxing career shortly after winning Olympic gold, debuting with a win against Tunney Hunsaker in October 1960. He continued to win and soon began developing the cocky, self-promoting attitude that fans would come to love. He displayed it memorably as his 1964 fight against Sonny Liston approached. They would be fighting for the heavyweight championship, and Clay taunted his opponent before the fight, with his verbal jabs including the famous quote, “Float like a butterfly, sting like a bee. The hands can’t hit what the eyes can’t see.” Fans initially mistook Clay’s grandstanding for nervousness, but in the end, Clay won both the fight and the heavyweight championship title, becoming the youngest heavyweight fighter ever to take the title from a reigning champion. 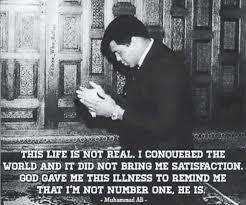 He took to calling himself The Greatest, and it stuck, becoming a popular nickname for the champion. In the same year he won his first heavyweight championship, Clay changed his name to Muhammad Ali, a decision he made after he converted to Islam and joined the Nation of Islam. He came to refer to Cassius Clay as his “slave name,” generating controversy among fans. The name change and associated controversy didn’t hurt Ali’s game – he continued winning, in a rematch with Liston, a title defense against former champion Floyd Patterson, a famously brutal bout with Ernie Terrell and more. In 1967, Ali was drafted to serve in the Vietnam War, but he refused, commenting, “I got nothin’ against them Viet Cong.” His title was stripped and his boxing license revoked, prompting a hiatus from fighting of more than three years. During that time, Ali appealed the decision and ultimately won his case in the U.S. Supreme Court, regaining his license and jumping right back into fighting with more winning bouts, leading up to a 1971 championship fight with Joe Frazier. It was billed as the Fight of the Century, held at Madison Square Garden, and Ali shockingly lost – his first professional defeat. It would be 1974 before Ali regained the championship, in the famous Rumble in the Jungle against heavyweight champion George Foreman in Kinshasa, Zaire. Ali retired in 1979 but quickly returned to boxing, fighting several matchups even as he began exhibiting the signs of Parkinson’s disease, with which he was formally diagnosed in 1984. He fought his final match in December 1981 against Trevor Burbick. In 1996, Ali was chosen to light the Olympic torch at the Summer Olympics in Atlanta, Georgia. He was a member of the International Boxing Hall of Fame, won the Arthur Ashe Courage Award in 1997, and received a Presidential Citizens Medal and a Presidential Medal of Freedom. He was named the Sportsman of the Century by Sports Illustrated magazine and Sports Personality of the Century by the BBC. Ali is survived by his wife, Yolanda “Lonnie” Williams, and by his children, Maryum, Jamillah, Rasheda, Muhammad Jr., Hana, Laila and Asaad. Laila is a retired professional boxer, an undefeated former super middleweight champion.